Bhopal: An Air India flight from Bhopal to Mumbai, carrying 90 passengers on board, had to make an emergency landing minutes after its take-off from Raja Bhoj Airport in Bhopal on Wednesday morning after a bird hit one of its engines, officials said. All the passengers are safe, they said. Nearly five minutes after the AI 645 flight took-off at around 7.55 am from the Raja Bhoj Airport, a bird hit it and entered the right engine, damaging its fans. The pilot apprised the Air Traffic Control (ATC) that the flight has to make an emergency landing which was allowed, an Air India official in Bhopal told PTI. “The aircraft made an emergency landing and all the passengers are safe,” he said. The aircraft was being repaired, he said, adding that the airline was taking care of all the stranded passengers. “We have plans to divert a Delhi-Mumbai flight from Bhopal to fly the 90 passengers to their destination,” he said. 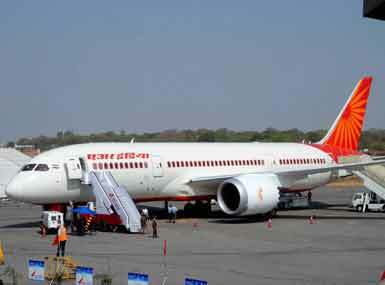 An Air India spokesperson in Delhi said the flight had to make a “precautionary landing” due to the bird-hit.